To save and check in the example Absence Request process, do the procedure in this topic. On the Process Builder screen, click Save . 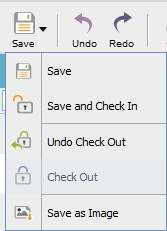 On the Save quick menu, click Save and Check In . The Process Builder screen closes, the Application Explorer screen opens, and Absence Request process is saved and checked in.